PACKED WITH 8+ EXCITING FEATURES! The Blue Crane Hoodie LITE wows and marvels with its striking looks and exciting features. It's the ultimate piece of apparel for life's thrill seekers. Please make sure you triple check our size chart at the bottom of the page before ordering your size. Life in the modern era can sometimes move at a blistering pace. We don’t always know what to take with us and what to leave behind, but what if you never had to leave anything behind? Whatever the journey, our hoodie is guaranteed to keep you up to the task. We’ve made it our goal to create a hoodie that is packed with creativity and innovation, but that is above all an everyday hoodie that you’ll want to wear day in and day out. As a hoodie, the Blue Crane hoodie is, in its most natural form, a stylish and modern everyday hoodie that has been crafted with intense care and an extreme attention to detail. We’ve focused on creating a hoodie that is luxurious in its feel and trendy in its look that is perfect for any occasion. Only after focusing on the looks does the focus shift to the features of the hoodie. The BC hoodie LITE is integrated with 8+ remarkable features that will make sure you’re ready for whatever the journey of life will throw at you. The hoodie is made from 260gram soft, premium quality fleece fabric. The inside of the hood and kangaroo pocket is lined with flannel fleece, one of the softest and most luxurious pieces of fabric available. Back pocket with hidden drawstring bag inside to convert to travel bag whenever on the go. Hand warming kangaroo pocket, with super soft flannel fleece lining. Separate layer zipped kangaroo pocket. Custom flag options on left arm. Personalisation options on drawstring bag. That’s actually a pretty darn good looking hoodie!? We’ve made it our priority to first make a strikingly good looking and comfortable hoodie, we only then shifted concentration to all of its amazing features. We want you to never want to be without it, and for that it has to have the looks. The look of the hoodie is inspired and stylized after the Blue Crane bird, symbolizing its travel and adventurous features. The peak of the hood and flaps on the front and back are all stylized after the beak of a bird. The BC hoodie logo is mutely added on the left chest, with a soft textured velvet finish. 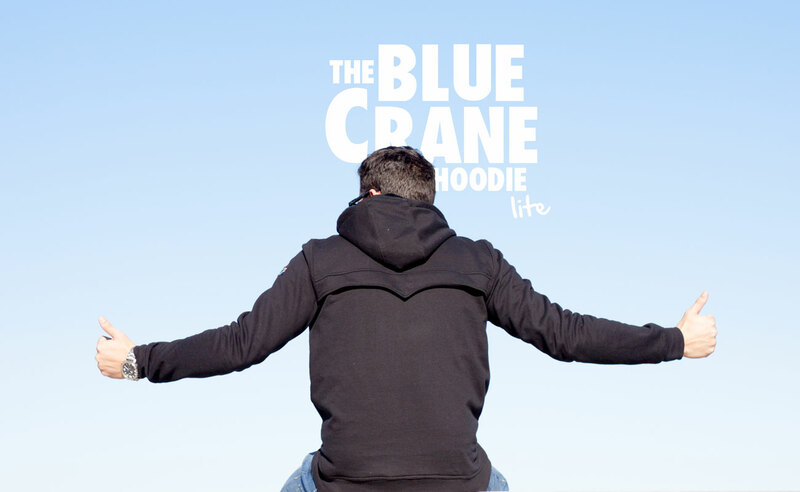 The Blue Crane is South Africa’s national bird, which will always serve as a subtle reminder of where your new favorite hoodie came from.